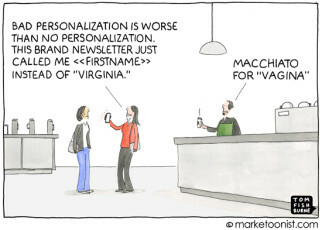 Marketing is increasingly “data-driven”. But that doesn’t have to mean “data-blinded”. It feels like there’s a polarizing schism between the art and the science of marketing — the Mad Men and the Math Men (and women). Mad Men resent the Math Men for taking over the creative process with analytics and Math Men resent the Mad Men for making marketing decisions based on subjective opinions rather than data. 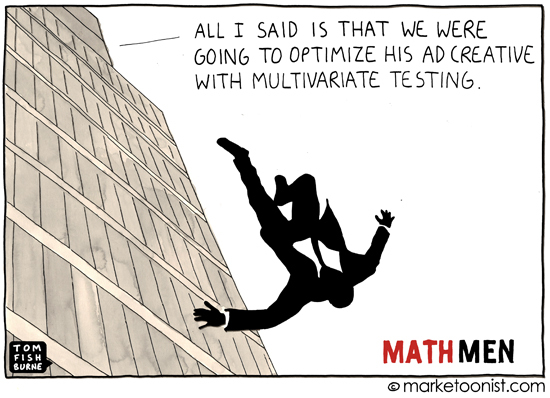 I drew this cartoon last year imagining data-driven marketing as the reason Don Draper’s silhouette falls from the sky scraper. But marketing ultimately needs both. Data alone can’t create the next big inspirational marketing idea. And marketing ideas need to be data-savvy to be effective. This creates a huge opportunity for the next generation of marketer. But, in the meantime, there will be friction. I’d love your thoughts on how best to adopt data-driven marketing. The Mad & Math Men both need clear objectives: what do we want to achieve? The Mad Men need it to focus their creative process. The Math Men need it to know what to optimize. So to become data-driven; start with clear consensus to what to achieve. An expansion on the driving analogy in your cartoon is that both (driving and marketing) require use of all the senses. You can not drive while just using touch, sight or sound independently. It is when you use all three that you arrive at your destination unscathed (unless you run across someone else who is not). 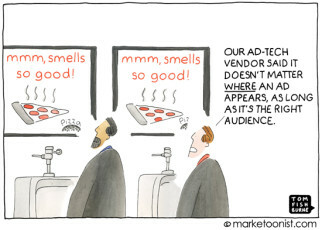 Marketing brings together many “senses”. The psychology of marketing is a powerful one, but utilized on its own without the research element it can send you off on endless tangents. Likewise, even if your data point is undeniably true, if it does not have a real world application or if it is just correlation without causation then it will not deliver. Love this post – thank you for it! Increasingly, we need to be analytical, even skeptical, of the data presented to us before we blindly use it to make a decision. 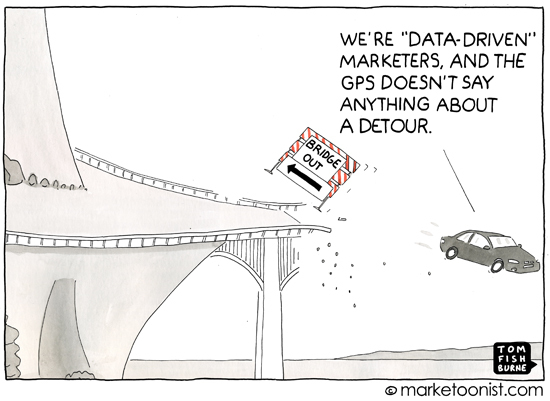 Data is used to prove or disprove a theory – not make decisions for us. We need to be cautious and understand what’s behind the data – quantitative and qualitative – before we use it to drive our decisions. Know what the data is representing before you use it to build a case. Nice work – as always Tom! Tom, right as always. My sense of B2B marketing is that (1) you talk to members of your target audience to find out where they get their information, who do they trust, what do they read/listen to/view and then (2) you factor in analytics to confirm and augment what you’ve learned. You try different things that seem to make sense and you use analytics to see which ones worked best. Big data is great but it’s only one component of the puzzle. As for the creative side… that’s a judgement call. Walk the walk, talk the talk, and look the part! Although at tradeshows my focus is on being very visible, memorable, and maybe a bit over the top (see memorable). I couldn’t agree more that there exists some conflict between insight and intuition. Far too often companies use data to justify bad decision-making, eliminating any responsibility for knowing their competition, their audience and their industry. Data-driven creative is often the safe route, but hardly the inspired route. Thanks for targeting and ongoing challenge of bringing these two worlds together. The reality is that you need to bring together the art AND science of marketing — it’s not an either / or. You need to consider the business impact of the decisions you are making and the ability of an organization to take action based on new learnings. That should not excuse the “I trust my gut and not your data” reaction though. What about neuro-testing data? Especially if it contradicts intuition and even insight. Will brain-scanned market testing provide creative directional insights — or just become the GPS for how to get to idiocracy? C: People complain that the entertainment industry caters to the lowest common denominator of public taste, but I disagree. C: Yeah, I think it’s a fallacy that taste bottoms out somewhere. If they could find some way to aim even LOWER, they’d make some REAL money. H: I’m sure there’s a brilliant career ahead of you. The intersection of Math & Mad is a fascinating dilemma, ripe with opportunity. Marketers did themselves a disfavour for years by allowing/encouraging themselves to be seen as “out there” and not bound by the maths. In the days when the maths was not really available, we revelled in the lack of accountability. Now the maths is available, most are uncomfortable. However, at some point of the intersection, wisdom, domain knowledge, implicit knowledge of various kinds if brought to bear on problems informed by the maths will find a creative solution not obvious to either Mad or Maths alone. Love the cartoon, says it all. It’s a symbiotic relationship. Mad Men need Math Men to inform the problem or opportunity and provide insights into past efforts. Math Men need Mad Men to propose creative solutions to put in market. Perhaps the struggle is in measuring success. Depending on the goal, success doesn’t always translate into tangible numbers. Either way – both add value and contribute to an organization’s success. What I find in my job as a conversion optimization consultant is that the mad men tend to not want to have their work stand up to the lens of actual performance. As a consultant, I hope for really great creative that helps to increase conversions. Instead, I see agencies proposing carousels on home pages, which I have never seen win an A/B test, and consistently fail usability tests. As other commenters have mentioned, the math men and the mad men need to work together to get the best results for their clients, but the incentive structure is not set up that way right now. Aligning the incentive structure will help to fix the current misalignment which causes the friction you’re talking about here. You are describing the difference between data & information. It takes creativity to turn the former into the latter. The Atlantic has a new piece up called ‘The Shazzam Effect’ about how data-driven marketing is shaping and driving the evolution of pop-music. Driving where? Depends on how you look at it. another question here arises about the validity of data over a number of days/weeks/months or even years…..marketers should consider the authenticity and the validity of the data information and its applicability with cross reference to the age of data information before integrating into the creative world of marketing….! Marketing is an industry of bullsh*tters who build careers from politicking, deception and snake-oil salesmanship. “Creating”, in the mind of a marketing executive, means “bullsh*tting”. In light of this, it shouldn’t surprise anyone that they are resistant to fact-based, quantitative, data-driven strategies. However, companies that don’t hire scientists to do the maths, like in all other industries, will fall behind, so this will be short-lived. Wide-scale quantitative data is the end of professionalised bullsh*tting, and good riddance. Great blog – It’s by far my new favorite. Absolutely love your cartoons, especially the first one on this post. I’m so happy someone finally said it. Data driven does not rule everything! This needs to be applied to EVERYTHING. There is also a new trend coming up with entrepreneurship where entrepreneurs want their whole product built off customer feedback. Find the pain point, and build exactly what customers tell you. “If I had asked people what they wanted, they would have said faster horses.” – Henry Ford. Use data to support your claims and sometimes as a general guide. Data will show you a narrow focus supporting a single point. IF you do something outside the ‘focus point’ then there is nothing data can tell you. It will help you optimize your ads but not come up with the creative for new ones. ~ Your new loyal subscriber.